You can print a brochure yourself, especially if you have access to a good photocopier. Or you can use the Pack and Go wizard in Publisher 2013 to send your brochure to a commercial printer. See Printing: Choose between desktop, copy shop, and commercial printing if you’re not sure which method to use. From your brochure template, click File > Print. Under Settings, make sure you are printing one page per sheet, have chosen the correct paper size, and are printing on both sides of the paper. Click the Print button at the top of the screen. From your brochure template, click File > Export. 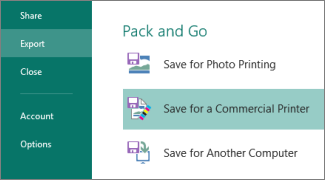 Under Pack and Go, click Save for a Commercial Printer. Click the arrow and click Commercial Press. Click Both PDF and Publisher .pub files. Click Pack and Go Wizard and save the files. Send the PDF and .pub files to your commercial printer.